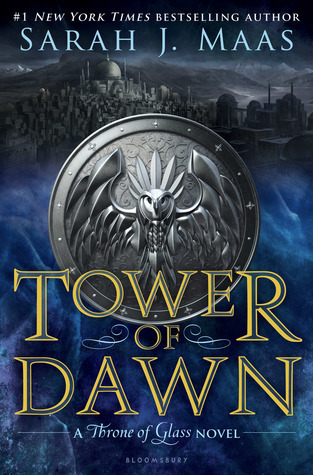 Review in a Nutshell: Tower of Dawn is an epic installment in the Throne of Glass series, full of series-changing plot twists and beautiful character development. Tower of Dawn takes place after Queen of Shadows and follows Chaol and Nesyrn on their journey in the Southern Continent, taking place parallel to the events Empire of Storms. I can’t go into any more details without getting spoilery, so lets move on to the other aspects of this great novel! The setting in Tower of Dawn was beautifully written, and very immersive. This book introduces new lands into the world of Throne of Glass that are absolutely amazing and added some fascinating dynamics to the political aspects of the plot, as well as epic new creatures. Sarah J. Maas’ writing style fully immerses you into her world, to the point where I was genuinely terrified in several scenes, something that she hasn’t done before in any other books in this series. There were multiple times where I was biting my nails, due to Maas’ atmospheric writing and beautifully crafted tension. Also, due to this book leaving behind Aelin and focusing more on Chaol, Nesryn, and Yrene, a lot fo the repetitive phrases and words weren’t used! For once, I was glad at the lack of “fae males” because I was so sick of seeing those words on the page. However, this book is still as mature as the ones right before it, toeing the line between YA and Adult, but not quite to the same extent as Empire of Storms. The pacing in this book was fairly good. It occasionally suffered due to the amount of new information that was exposited, but there were plenty of action scenes and tense moments to make up for it. The overall mystery was very interesting, and there were plenty of plot twists to keep you on the edge of your seat. I can see what Maas changed this from a novella to a full-length novel, and why it’s required reading for this series. This book ties together a lot of major characters and plot points in ways that will be crucial for the final novel. Sorry, this may be long…. When I first heard of this book (back when it was a novella), I wasn’t excited. I didn’t like Chaol, I never really did, and I didn’t want an entire book focusing on him instead of Aelin (especially after the ending of Empire of Storms!) I was prepared to push through this book and get it over with, but it actually ended up being one of my favorites, and changing my mind about Chaol. His growth in Tower of Dawn is amazing. He became a character I could respect and like over these 600+ pages. Due to the events of the Queen of Shadows(I won’t spoil what events), obviously Chaol has a lot of work to do, and this book really emphasizes the mental and psychological aspect of said work. I was afraid of how they would deal with what happened to him, but I was very happy with the result. Nesyrn was another interesting and complex character, who in the previous books I liked but didn’t feel a connection toward. This book changed that and made me really love her. She is strong, both physically and mentally, and very admirable. She is also very caring and dedicated to her biological family, not just the protagonists, something that isn’t really a trait in many other characters in this series (mostly because their families are dead, but still). Yrene is our third main character of this book. You might remember her from The Assassin’s Blade. I loved seeing her again and watching her journey. Tower of Dawn also introduced multiple new characters, from the children of the Khagan to the healers at the Torre. Each character introduced added their own flair to the story and I’m excited to see what Maas is going to have them do next (especially Sartaq and Hasar). With these new characters, there was a lot of added representation that I felt was desperately needed in this series. Almost all of the side characters were POC and there was more LGBT representation that I really appreciated. Hopefully, Kingdom of Ash continues in this trend. Tower of Dawn was one of the best recent additions to the Throne of Glass series, and only makes me more hyped for the final novel!